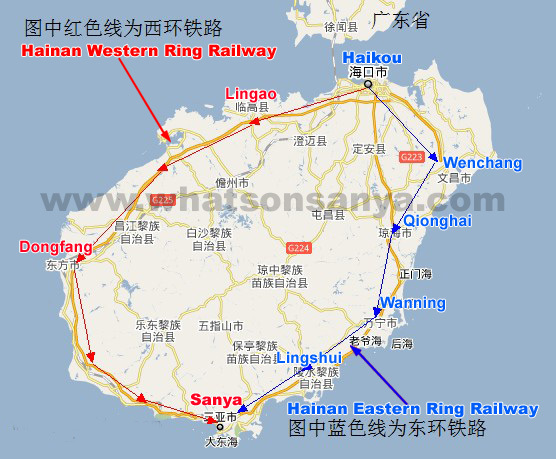 The rail section between Sanya International Phoenix Airport and downtown Sanya of the Hainan Western Ring High-speed Railway is scheduled to start construction in February, 2012, according to a meeting held on Tuesday in Haikou by the Ministry of Railways and the Hainan provincial government. Mr. Jiang Dingzhi, deputy-governor of Hainan province said at the meeting that the Hainan Western Ring High-speed Railway has been listed as one of the most significant projects in Hainan during the 12th Five-year Plan period (2011-15), and it is expected to be an impetus to the construction of the Hainan International Tourism Island, as well as to Hainan‘s economy. The Hainan Eastern Ring High-speed Railway, which opened in December 2010 linking the capital Haikou at the northern end of the province to Sanya, has proven to be a drawing card to Hainan tourism. The full line of the Hainan Western Ring High-speed Railway is expected to start construction in the second half of 2012, according to Mr. Jiang.